The sparkling desert venue hosted the penultimate round of the NHRA POWERade Championship and produced some stellar performances as the air cooled during the evenings from the daytime highs. It not only produced some track records that traded places but had a number of fiery qualifying finishes the worst being from Larry Dixon who came safely out of a huge conflagration. Top Fuel was dominated by Tony Schumacher who laid down the gauntlet early on with a stunning 4.445 at 333.08mph almost eight hundredths ahead of the next man, Brandon Bernstein at 4.522/329. Bump spot was held by Mike Strasburg on a 4.628/321 and several names unfortunately had to sit out on the DNQ bench. 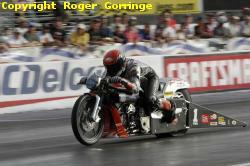 The opening round started with ‘Aussie’ Dave Grubnic running a 4.609/295 over a smoking 6.731/123 from Doug Herbert. In a close race that was won on the start line Rod Fuller achieved half a car lead in the lights with a 4.569/325 as Melanie Troxel followed with a 4.567/328 lose. Steve Torrence managed to oust Cory McClenathan’s 4.632/320 with a holeshot 4.609/321. 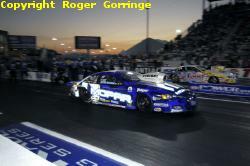 Continuing his charge was J.R. Todd who left well on Larry Dixon winning with a 4.539/318 to a 4.666/313. 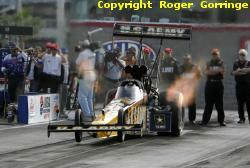 Tony Schumacher managed more points with a fine 4.488/325 win in the heat as Mike Strasburg slowed to a 5.030/209. David Baca managed to broadside his fueller just before the sand trap when his 4.585/320 remained with no chutes but it was Brandon Bernstein that clicked on the win light with a 4.549/323. Alan Bradshaw got into a bit of a weave at half track negating his 4.613/321 and allowing Hillary Will to take the win with her 4.565/324. Ending round one was the duel between Doug Kalitta and Bob Vandergriff with Kalitta leaving on Vandergriff, a 4.581/325 to a 4.689/320. Round two saw Hillary Will light the tyres at one hundred foot and again at the three thirty mark slowing her to an 8.872/83 as Doug Kalitta stormed to a 4.547 at 324mph. Rod Fuller put his holeshot to good use, carding a 4.579/327 as Brandon Bernstein chased but failed to catch with a better 4.564/326. 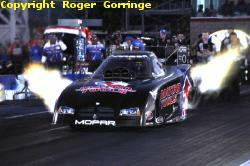 In a battle of the Skull Shine cars J.R. Todd beat Steve Torrence by a car length in a 4.582/320 win to a 4.663/311 lose. Dave Grubnic fell foul to tyre smoke at about two hundred and fifty feet out slowing to a 7.32/110 as Tony Schumacher surged ahead with a clean 4.538/330. Todd managed another success with a 4.582/318 win over a luckless Fuller who lot power at sixty foot and recorded a lowly 20.553/31 lose. Tony Schumacher trounced points leader Doug Kalitta to end the semi finals when he ran a winning 4.494/322 to pass Kalitta’s startline leave but losing 4.584/327. The final pitted the U.S. ARMY backed fueller of Tony Schumacher against the Skull Shine car of now seasoned rookie J.R. Todd. Schumacher stated he was after as many points as possible to catch Kalitta and hoped for a record setting performance, it was not to be though but the defending Champ did take home the trophy with a fine 4.469 at just 313mph due to a small fire just before the lights as Todd was chased down losing with a 4.55/320. The Budweiser Shootout was taken by Doug Kalitta who ran a 4.567/329 $100,000 winner over a blower belt throwing Rod Fuller’s 4.669/266. Funny Car struggled in qualifying round one until team Force performed their magic and for the rest of qualifying Robert High took pole position with both ends of the track record at 4.677 at 333.08mph just ahead of boss John Force at 4.711/329 and Eric Medlen at 4.712/320. Tony Bartone sat on the tail end with a 4.848/313 and once again several surprise names were included in those that did not make the cut. Round one kicked off with a 4.813/323 win for Tommy Johnson Jr. as he beat the 4.837/318 from Phil Burkart Jr. Scott Kalitta managed a 4.81/316 win putting Ron Capps on the trailer with the losing 4.866/317. Jim Head smoked the tyres and got crossed up at three quarter track slowing to a 7.165/118 as John Force won with a 4.832/322. Robert Hight was absolutely dismayed when the car suffered a broken blower part during the burnout negating his chance of a run as the car sat on the track allowing Tony Bartone to take an easy ride to win with a 5.406/198. 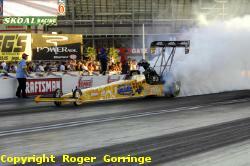 Eric Medlen dealt a 4.763/321 winner as Bob Gilbertson hit instant tyre smoke losing with a 12.779/91. New driver jack Beckman who replaced Whit Bazemore performed well with a fine 4.793/324 as Gary Densham went the way of the smoking slicks at half track slowing up to a 7.295/118. Mike Ashley got a little loose moving around his lane and recording a 5.312/217 lose as Del Worsham carded a 4.828/320 win. The last race in the round was a real battle and close call as firstly Gary Scelzi hazed the tyres at quarter track then Tony Pedregon lost some cylinders slowing his ride down just before the stripe as Scelzi re-powered and zoomed to a 5.179/319 only to be beaten by the 5.143/225 from Tony. Into the second round and Tony Pedregon’s luck went away as he slowed to a 5.177/211 allowing Tony Bartone to pass with a 4.881/312 win. John Force suffered the smoking tyre gremlins, blazing the hides at half track and slowing to the lose of 8.238/105 as Tommy Johnson Jr. capitalised on the fun with a 4.809/320 win. Scott Kalitta also fell foul to the smoke hazing the slicks at the halfway mark and slowing to a 6.837/127 as opponent Eric Medlen clinched a winning 4.799/321 time ticket. Last in the round pairings was Del Worsham who lost power at nearing three quarter track, his 5.791/179 stayed well behind Jack Beckman’s charging 4.825/322 win. The semis had Bartone get close to the centre line clicking off with a 5.284/210 lose as Beckman notched up another round win with a 4.803/324 clocking. Medlen’s 4.808/320 failed to catch the run by Johnson whose ticket read 4.810/322. The final paired the Skoal backed ’05 Monte Carlo of Tommy Johnson Jr. against the Matco Tools ’06 Dodge Charger of rookie Jack Beckman and it was the new boy that stormed after TJ as he struck the tyres and tried to pedal slowing the Skoal car to a 5.704/244 and allowing Jack Beckman to pick up his first Funny Car trophy. Pro Stock qualifying was headed by Jason Line with a 6.705/204.94 both new track records and ahead of Allen Johnson’s 6.726/204 and Dave Connolly’s 6.727/204, the bump spot taken by Warren Johnson’s 6.769/203. Several big names failed to make the final cut. First round standout victims included Kurt Johnson to Jeg Coughlin, Warren Johnson to Jason Line, Allen Johnson to Richie Stevens Jr. and Kenny Koretsky to Tommy Lee. Into round two and Richie Stevens stunning leave got the better of Larry Morgan who failed to catch the 6.811/202 with the 6.83/202. Tom Martino suffered problems on his leave and limped to a 30.15/52 as Dave Connolly powered to a 6.776/202 win. Greg Anderson managed a 6.783/203 win over the 6.803/202 from Tommy Lee, and last pair saw Jeg Coughlin’s great light get overhauled by the charge of Jason Line, 6.767/203 win to the 6.81/202 lose. Dave Connolly fouled away his chances with a red light time of 6.782/203 leaving the win open for Richie Stevens Jr. whose 6.800/203 got him a place in the final. The first 2006 POWERade NHRA Champion was crowned as Jason Line took the semi final win with a holeshot 6.751/204 over teammate Greg Anderson’s 6.773/204 try. With the Championship firmly clinched by Jason Line’s Summit Racing Equipment Pontiac GTO perhaps he had not reckoned with Richie Stevens Jr.’s third stunning light of competition. A 0.002 from the Mopar/Valspar Dodge Stratus leapt out and coupled with a 6.789/202 beat the new Champs 6.735/204. Pro Stock Motorcycle top qualifier changed hands from Andrew Hines 7.102/187 to Shawn Gann’s track record 7.090 coupled with a 189mph speed. Bottom of the sixteen qualifiers was Marco Andreano’s 7.166/183. Notable names that did not make it through the red light littered round one included Chip Ellis to GT Tonglet, Craig Treble to Ryan Schnitz and Karen Stoffer to Angelle Sampey and into round two GT Tonglet ran a 7.352/178 as Shawn Gann red lit away a 7.25/186. Angelle Sampey also managed a glittering red light, her 7.285/182 wasted as Ryan Schnitz won with a 7.255/183. 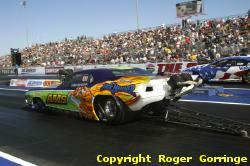 Geno Scali caught and passed the slight lead from Matt Smith, a 7.258/183 beating the 7.304/176. Another red light glowed, this time in Antron Brown’s lane, his 7.229/182 useless against the legal 7.151/186 from Andrew Hines. Both wins in the semis were by way of the opponent red lighting, first was Scali with a red light 7.247/184 to GT Tonglet’s winning 7.191/184, then came Schnitz’s 7.195/185 that was disqualified by the cherry leaving Hines to take the win with a 7.126/187. It was a team final as both Screamin’ Eagle/Vance & Hines ’02 HD V-Rods of Andrew Hines and GT Tonglet faced off but it was Hines that scored as his holeshot together with a 7.08/188 won the event as Tonglet trailed with a 7.31/181 runner up. The AMS Staff Leasing Pro Mod Challenge wound up a win for Troy Critchley and his ’70 Barracuda with a 6.098/235 as opponent Jay Payne’s ’05 Dodge Stratus got crossed up around three hundred feet out and was disqualified for hitting the centre timing blocks. TheSuper Stock win went to Greg Luneck and his ’65 Nova Wagon an 11.058/116 beat the 9.628/131 from Tony DeFrank’s ’06 Cobalt. Stock Eliminator had Clark Holroyd take his ’68 Nova to the winners circle with a 10.659/122 as opponent Mark Faul runner upped with an 11.264/110. Super Comp saw Kevin Kleineweber sew up the win with a 9.056/156 to the 9.049/171 from Terry Edwards. Super Gas had the ’00 Corvette of Bob Harris take the win with a 10.043/155 over the 10.042/155 from Richard Okerman’s ’89 Beretta.